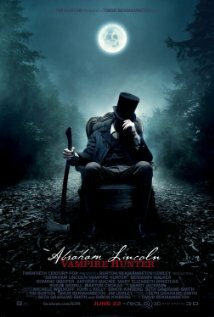 I like Lincoln, the Steven Spielberg film, but not everybody does. Rex Reed, for instance, thought the film was "wooden" and "arid." Louis Nayman, a longtime union organizer, who writes for In These Times, is another Lincoln (the film) nay-sayer. His review also panned the Spielberg film, but Nayman at least suggests a Lincoln-related alternative, a film called Abraham Lincoln: Vampire Hunter. I have yet to see the "Vampire Hunter" film, because I am not usually a "vampire" kind of guy. Nayman's review, though, makes a good case, and I am thinking that I should put Abraham Lincoln: Vampire Hunter on my list. Since I haven't yet seen the film, I am not sure how heavy-handed the metaphor is, but it's clear that Abraham Lincoln: Vampire Hunter equates slavery with vampirism. Not a bad equivalency! I am not informed enough about vampire lore to know whether or not that observation is consistent with vampire literature in general. But it sure rings true for politics!